Living Tongues project coordinator Anna Luisa Daigneault recently wrote an article about Nuu-chah-nulth language revitalization efforts on Vancouver Island in British Columbia, Canada. View the full article here. Image above: Kathy Robinson is a language warrior. 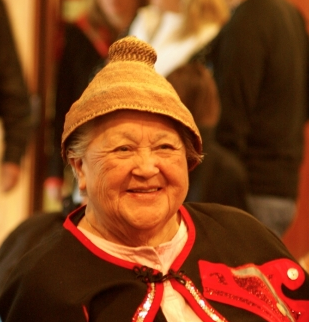 At the age of 81, she is one of the last two fluent native speakers of Tseshaht (pronounced “tsi-sha-aht”), a language once popularly spoken on the west coast of Vancouver Island, British Columbia. The Tseshaht people are one of 14 Nations that make up the Nuu-chah-nulth Tribal Council. This entry was posted in Endangered Language Activism, Indigenous Language Activists, Media and Publicity, Support Endangered Languages and tagged aboriginal, Anna Luisa Daigneault, BC, British Columbia, canada, endangered languages, hishuk ish tsawalk, indigenous, language revitalization, nuuchahnulth, tseshaht by livingtongues. Bookmark the permalink. You really make it appear so easy together with your presentation but I to find this matter to be actually one thing which I believe I might never understand. I am looking forward to your next post, I’ll try to get the hang of it!